Over the last couple of weeks I keep seeing signs advertising a local fish CSA called Village Fishmongers. Finally today I checked out their Facebook page and was very excited by what I saw. 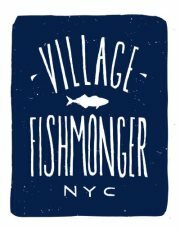 Available at 4 pick up locations (3 in Manhattan and 1 in Williamsburg Brooklyn) Village Fishmongers offer local, sustainable seafood on a weekly basis with 6 options to choose from starting at $13 and going up to $60. You can choose from either whole fish of fillets. A seafood CSA is a great way to support local small scale fishermen (and women?) and to make sure you have a fresh supply each week. So if you eat fish and live in NYC check out Village Fishmongers! This entry was posted in NYC, Other Stuff and tagged Seafood CSA, Village Fishmongers. Bookmark the permalink.